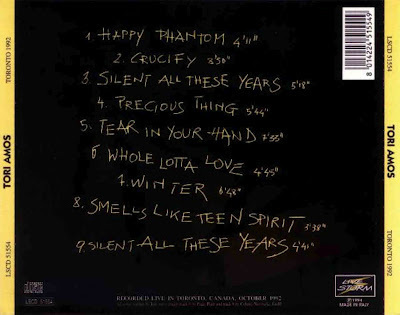 Recorded Live at The Phoenix Club, Toronto, Ontario, Canada - October 28, 1992. Excellent Soundboard or Audience Recording :: Silver CD :: MP3 CBR 320 kbps & FLAC. Files: 9.:: Size: 117.82 MB (mp3)| MB (flac). Notes: "Toronto 1992" - liberated bootleg (Live Storm LSCD51554) Same as "Message From Your Heart" CD. Lineage: Silver CD > EAC > WAV > FLAC Frontend > FLAC. <-(Info taken from original info file). Great blog , but why no frank Zappa or Mothers Of Invention . Nice, Tori Amos! Let's have a bit of that. Thank you!